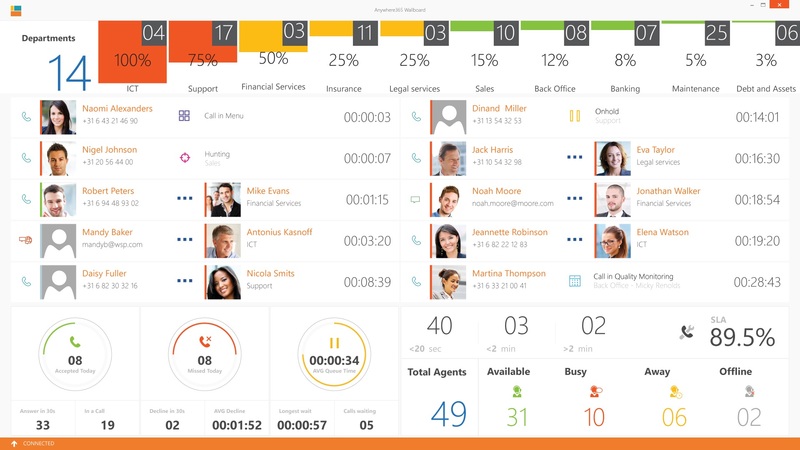 The Inflight Wallboard is a graphical interpretation of your UCCsUCC stands for Unified Contact Center and consists of a queue that can be handled by Agents Each Contact Center has its own settings, interactive voice response questions and Agent with specific skills. Agents can be member of, or sign up to, one or more Contact Centers. displaying realtime information about Agents and Queues. The information adapts itself, to rate of active conversations. At one glance the Wallboard gives insight on the real-time stats. Every viewer can see the real time statistics, just by looking at the screen.